A huge range of e-commerce platforms have sprung up in the last couple of years, making it easier than ever to sell online (including our favorites, WooCommerce + a WooCommerce wholesale plugin). However, most platforms make it difficult to distinguish between retail and wholesale customers. This post will explore how to make WooCommerce wholesale ordering easy for them. You can set up totally separate stores for your retail and WooCommerce wholesale ordering customers, but this is extremely inconvenient. Your technology should be working for you, rather than creating work for you. Fortunately, there is a better way to create your wholesale store. WooCommerce is one of the most powerful and widely-used e-commerce platforms on the web. Its integration into the WordPress Content Management System makes it endlessly customizable, with the broad range of plugins available that change and expand its functionality. With the best WooCommerce wholesale plugins, you can simply and effectively cater to both your WooCommerce B2B and B2C customers all using the same system, with a great user experience at the front end and an easy-to-manage back end. This is your complete guide to creating a WooCommerce wholesale ordering store. How to create a private wholesale area. This section will cover several ways to protect your WooCommerce wholesale ordering store, using two wholesale plugins – WooCommerce Protected Categories and WooCommerce Private Store. With these WooCommerce wholesale plugins, you can either create a completely hidden B2B store; or a public retail store with private wholesale area. How to create user-friendly wholesale layouts & order forms. This section will teach you how to list products in an easy-to-use WooCommerce wholesale ordering form layout using the WooCommerce Product Table plugin. B2B customers don’t want to browse through multiple pages or look at big images, so a wholesale quick re-order list with quick view options is a must. At the end of this tutorial, you will know how to create a WooCommerce wholesale store with all the features you need. It’s easier to set up than other WooCommerce wholesale plugins and membership plugins, and by the end of this tutorial you’ll have everything you need get your WooCommerce wholesale ordering set up today. First, install the WooCommerce plugin on your WordPress website. Add some products to get started. At this stage, all your products will be publicly available and presented in the default layout. Keep reading, choose your plugins, and follow our instructions to set them up! Firstly, here are 3 simple ways to protect your wholesale WooCommerce store from public view so that only approved wholesale customers can access it. You might choose to set up a standard online retail store with a separate private wholesale area. Or you can even have a 100% hidden WooCommerce wholesale ordering store that no one else knows exists! Below, you’ll find a summary of all 3 methods and the B2B plugins they use. Read the descriptions, and we’ll help you choose the WooCommerce wholesale plugin that’ll work best for you. Then just skip to the setup instructions. Go to method 1. This lets you create a password protected category for your WooCommerce wholesale ordering products and give the password to your wholesale users. You can use it to create a completely hidden shop, or your wholesale category can exist alongside your public WooCommerce store. Only people with the correct password can view and buy your protected products. The instructions for method 1 show you how to create a wholesale area for all your B2B customers. If you sell different products to different customers, you might prefer our tutorial on how to create a wholesale store with customer-specific categories. This method also uses the WooCommerce Protected Categories plugin. However, it’s more secure because, instead of basic password protection, each wholesale customer has their own user account on your website. The hidden WooCommerce wholesale area will only be visible to logged in wholesale customers, and it will be hidden from standard retail customers. If this applies to you, go to method 2. You’ll learn how to create a private wholesale category which is automatically visible to logged-in wholesale users. You can hide your entire store or have separate public and private areas within WooCommerce. If this sounds like what you need, go to method 3. This lets you hide your entire WooCommerce store behind a simple password or user login. You can have a single password shared by all your wholesale customers, or a different password for each person. You can also create a unique user account for each wholesale customer, and automatically unlock your WooCommerce wholesale store for logged-in users. Either way, all your WooCommerce products and categories will be completely hidden from public view. Here’s a step-by-step video tutorial of how to use password protected categories to create a WooCommerce wholesale area. If you prefer, you can follow the written instructions below to create your wholesale store. Buy the WooCommerce Protected Categories plugin. Install and activate the plugin, then add your license key using the instructions in the confirmation email. Log into the WordPress admin and go to Products → Categories. Add one category for your public shop. In the list of categories on the right, you’ll see that your WooCommerce wholesale category is labelled as password protected. The plugin lets you create sophisticated structures for your WooCommerce wholesale area. You can create more complex navigation structures for your WooCommerce product categories, if you need. For example, you can add as many public categories as you like for retail customers. You can also divide your WooCommerce wholesale area into sub-categories. If you do this, leave them as ‘Public’ and select your main wholesale category as the ‘Parent’ of all the sub-categories. This will automatically protect all your WooCommerce wholesale categories with the same password as the parent category. Your wholesale users will only have to enter the password once in order to unlock the entire wholesale area. This method is much more user-friendly than any of the alternatives, such as creating separate categories with different passwords, or password protecting each individual WooCommerce product. Of course, if you want to create separate wholesale areas for different B2B users, then you can create more than one password protected category. Give each type of wholesale user the password for their category. Next, go to the ‘Products’ section of the WordPress admin. Hover over the name of each product, click ‘Quick Edit’ and add it to the relevant category. Note: If you add a product to a public and a private category, it will automatically be password protected. The WooCommerce Protected Categories plugin does this to keep your products secure and prevent mistakes. If you want to sell the same product in your public and wholesale stores, you’ll need to create duplicate versions of the product. You can easily do this with the free Duplicate Post plugin. The added benefit of having a separate version of each product in the retail and B2B areas is that you can easily charge different prices to wholesale users. If you don’t want to duplicate your products, then check out our tutorial on how to build a WooCommerce wholesale order form with role-based pricing instead. Now, visit the front end of your website. You’ll see that only your public categories and products are visible on pages such as the main shop and in product and category widgets. I personally think that this is the best option for most WooCommerce shops that have a wholesale area. However you can change this, if you’d rather make your password protected wholesale categories visible on the main shop page. To change these visibility options, go to the WordPress admin and go to WooCommerce → Settings. Click on the ‘Products’ tab and you’ll see a new option called ‘Protected Categories’. This is a settings page added by the WooCommerce Protected Categories plugin. You can see several options on this page relating to the visibility of your password protected wholesale categories. Use these to control whether your protected categories and their products appear on the main shop page and in widgets and menus. I recommend keeping the links to your WooCommerce wholesale area separate from the navigation for your public online shop. This is more professional for your retail customers and prevents them from accidentally being taken to an ‘Enter password’ page. Link your wholesale customers directly to your WooCommerce wholesale product category. Go to Products → Categories, find your wholesale category and click on the ‘View’ link that appears when you hover over it. This will take you to your wholesale category page. Copy the URL from the address bar at the top of your browser tab; this will be a direct link to your Password Protected store. Anyone who clicks on this link will be prompted to enter their password. Once wholesalers have entered the correct password, they will have access to the WooCommerce wholesale area. Create a WooCommerce category login page – Alternatively, you can add the shortcode [category_login] to any page or widget. This lets you add a wholesale login form anywhere on your website, so it’s more flexible. It’s also good if you have multiple protected categories as wholesale customers can use this login form to access any of your categories. They will automatically be redirected to the correct wholesale category depending on which password they enter. Next, add a link to your B2B category or WooCommerce wholesale login page. Call it something like ‘Wholesale Area’ to discourage retail customers from clicking it. You can add this as a Custom Link in the navigation menu (Appearance → Menus), in the footer, sidebar or anywhere else your theme allows such as a pre-header bar. What if I don’t want to link to my wholesale area? If you want to keep your WooCommerce wholesale store completely private, you can skip this step. Instead of adding a link to it, you can give your distributors the link directly (e.g. by sending them an email). As a result, retail customers will never know there’s a separate wholesale area. Now your WooCommerce wholesale plugin is set up, it’s time to give the password to your wholesale users. They can enter the password and unlock the protected products within that part of the site. Your retail customers will only have access to the public area of your online shop and can continue to buy your products as usual. The plugin knowledge base provides more information on using password protected categories for a WooCommerce wholesale store. Create a password protected WooCommerce wholesale area today. If you want your wholesale users to have their own individual logins for the website, you can use the role protection instead. This is another option that comes with the WooCommerce Protected Categories plugin. But instead of password protection, it creates a private WooCommerce category which only specific user roles can access. Once your wholesale users log into their account, the hidden wholesale area will automatically appear for them. Want a video? For a video tutorial of this method, check out the video in Method 1, above. This also covers Method 2. First, you need to create a dedicated WordPress role for wholesale users. You can do this using the User Role Editor plugin. Install the plugin and duplicate the ‘Customer’ role to create a ‘Wholesale’ role. Next, get the WooCommerce Protected Categories plugin. Install and activate the plugin, and enter your license key using the instructions in the confirmation email. Log into your WordPress admin and go to the Products → Categories page. Add a category for your public shop. Now add a main category for your WooCommerce wholesale area. 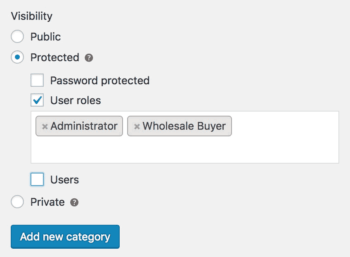 Tick ‘Protected’ in the’Visibility’ section, choose the role protection option, and select the ‘Wholesale’ user role you created in Step 1. Also select ‘Administrator’ so that you can access the wholesale area. Finally, click ‘Add new category’. In the categories list on the right hand side, your WooCommerce wholesale category will be marked as ‘Protected (Role)’. You can also add sub-categories to your private WooCommerce wholesale area. Leave them as ‘Public’ and select your main wholesale category as the ‘Parent’ of each child category. Because of this setting, the plugin will automatically restrict all the sub-categories to logged in wholesale users. Now it’s time to put your wholesale products in the new private wholesale category. Hover over each WooCommerce product, click on ‘Quick Edit’ and select the appropriate private category or sub-category. Save each product. You’ll see that you can only view the WooCommerce wholesale categories and products when you’re logged as a wholesale customer. Initially, the private categories and products will be hidden from public areas of your store. For example the main WooCommerce Shop page and your product and category widgets. This is the best option for most WooCommerce wholesale stores, but the plugin lets you change it if needed. Go to WooCommerce → Settings, click the ‘Products’ tab and look for the ‘Protected Categories’ section. This page contains several settings where you can control how private wholesale categories and products appear to the public. Tweak these and revisit the website from both browsers until you’re happy. I think the most user-friendly way to create a private wholesale area in WooCommerce is to keep everything separate. Even though your private products/categories will only be visible to logged in wholesale users, it will confuse them to suddenly see wholesale products on the public shop page after they log in. Wholesale login link – Add a prominent login link so that B2B users can log into the wholesale area. This can be the same login page that your public customers use to log into their accounts. Use the free Peter’s Login Redirect plugin to dynamically redirect users with the ‘Wholesale’ role to the main wholesale category after they login. Wholesale Area – Add a link to your wholesale category to the navigation menu. Also add a dropdown menu with links to any wholesale sub-categories. Use the plugin settings page to ensure the link only appears to logged in wholesale users. Finally, you need to create a user account (Users → Add New) in WordPress for each wholesale user. Assign them to the wholesale role you created earlier. When your B2B users login, they will have access to your private WooCommerce wholesale area. Your public customers won’t even know the private products and categories exist. Create hidden product categories for your logged in wholesale customers today. Some Woo wholesale stores choose to offer different payment methods for B2B and B2C customers. For example, trade customers might pay by invoice rather than online. Other stores have different shipping options for wholesale users, which are more suitable for bulk buying. The good news is that there’s an excellent plugin that caters for both these possibilities. Role-Based Payment / Shipping Methods is a WP plugin available on woocommerce.com. It provides easy ways to offer different shipping and payment methods depending on the user role. Use it to set your standard B2C options for retail customers and guests; and your B2C options for logged in wholesale users. Using this method, all areas of WooCommerce will be hidden from public view, including all your products, categories, tags etc. All WooCommerce content will be automatically hidden from search engines. Your normal web pages (e.g. Home, About and Blog) will remain public, but your entire e-commerce area will only be visible to wholesale users. To unlock the hidden WooCommerce wholesale store, B2B customers must either enter a password or log into their user account. Here’s a video tutorial on how to create a private WooCommerce wholesale store. You can also find written instructions below. Get the WooCommerce Private Store plugin. Use the instructions in the confirmation email to install and activate the plugin. 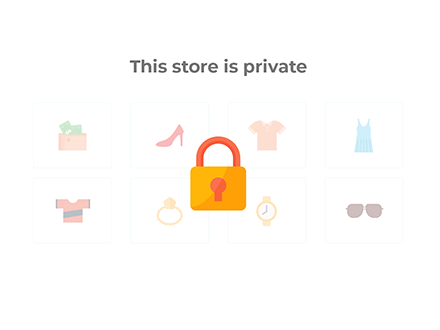 Enter your license key on WooCommerce → Settings→ Private Store. Go to Pages→ Add New and create a page where your wholesale users will log in. You can either leave this blank or add some content. Go back to WooCommerce→ Settings→ Private Store. Select the wholesale login page you created in step 2 and add one or more passwords for your wholesale store. If you like, you can also change the text that appears above the wholesale login form and on the Submit button. Alternatively, tick the ‘Logged In Users’ box so that the store will automatically unlock for logged in customers without having to enter another password. And that’s everything you need to do! Simply following the above steps will lock down your entire WooCommerce store so that only your wholesale customers can access it. Here are a few more tips on creating your WooCommerce wholesale store. But you can stop now if you like, as the hard work is already done! How will wholesale users access your store? Decide whether you want to link to your WooCommerce wholesale login page, or whether it will be completely hidden from your public website. If you like, you can link to the wholesale login page from your menu or elsewhere on your website. 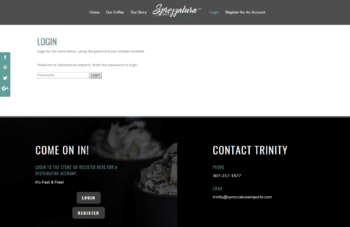 You can also insert a login form anywhere on your website using the shortcode [store_login] e.g. in a sidebar widget. If you’d rather keep it hidden, you don’t have to link to the WooCommerce wholesale login at all. Instead, give the URL to your wholesale users so they can access the login page directly. Note: If you’ve ticked the ‘Logged In Users’ box in the settings, you don’t need a separate store login page. The store will automatically unlock when customers login. It’s worth mentioning that this WooCommerce wholesale plugin supports hidden menu items and widgets. You can also add any of the standard WooCommerce widgets found in Appearance → Widgets. Again, these will disappear from your sidebar for public users. 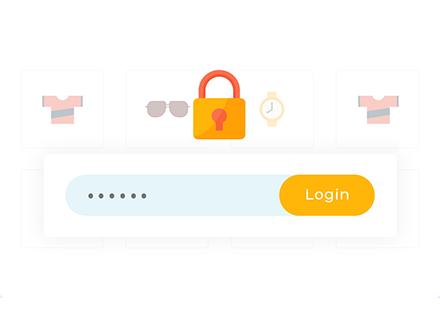 When a wholesale customer enters the correct password, these WooCommerce widgets will magically appear! Use the plugin knowledge base to find out more about what this WooCommerce wholesale plugin can do. Sprezzatura Imports distribute the Italian coffee brand, ICAF, across the US. As wholesalers, they need to keep their WooCommerce wholesale store private from the public. That’s why they’ve password protected it with the WooCommerce Private Store plugin. After registering, distributors can purchase products and gain access to the price list by logging in to the password protected area. Then, to make it even easier for distributors to login, the login page was added to the menu. As a result, the private area is just a matter of clicks away from the homepage. So far we’ve covered the best ways to protect your wholesale area from public users – this is about functionality. The other type of WooCommerce wholesale plugin you’re likely to need focuses on the layout of your wholesale store. This is more to do with user experience. There’s little point having a private section for wholesalers if it’s clunky and difficult to use, or if it appears identical to your retail section. You need to ensure that you’re offering a visually different experience that’s better catered to the needs of wholesalers. Public e-commerce shops tend to use a standard layout with large product images and basic information, suited to retail customers who don’t need to know detailed specifications for each product but do want eye-catching, persuasive visual listings. Customers can browse the products and click through to view more detail on individual product pages. This retail-style layout isn’t suitable for most WooCommerce wholesale stores. WooCommerce Product Table offers a more wholesale-friendly layout. Products are listed in a responsive space-saving grid or tabular layout with extra product data. This is more appropriate for wholesale customers, who are already familiar with your products. They want to see all the information at a glance and make quick buying decisions. A product table layout provides an easy way for B2B customers to re-order their regular products, acting as a wholesale quick re-order list. 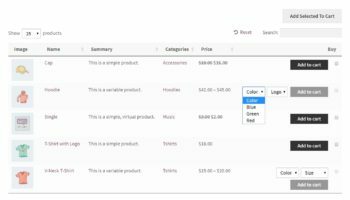 Learn how to use the Product Table plugin to create a bulk WooCommerce order form or product list view. PolBazar24 is a Polish food wholesaler. They’ve made it as simple as possible for customers to place an order using their one-page wholesale B2B re-order list powered by WooCommerce Product Table. Everything a customer needs to know before ordering is listed in a quick-to-view layout, from a short description to a product’s price and weight. There’s even an indicator to show whether the product is in stock or not. As most wholesale customers know what they’re looking for, they just need to check what they want is in stock. Then all they have to do is enter the quantities they need and click add to cart. Read on to find out how to create your own wholesale product tables for WooCommerce. Yarn Gate use their WC wholesale website to sell high quality knitting yarn to B2B and the trade. 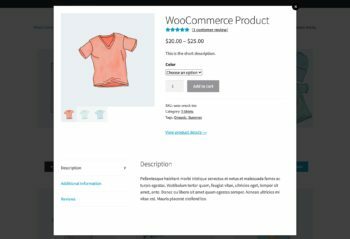 They use Woo Product Table together with Quick View Pro and WooCommerce Variation Swatches and Photos to create the perfect suite of WooCommerce wholesale plugins. The developer wanted a quick one-page wholesale order form that would allow quick buying away from the single product page. They also wanted wholesale customers to be able to click on an image for each color option. The best way to achieve this was to combine the three plugins and select color swatches from a quick view wholesale lightbox. Keep reading to learn how to achieve the same for your own WooCommerce wholesale website. Get WooCommerce Product Table. Install and activate the plugin using the instructions in the confirmation email. Go to the plugin settings page – WooCommerce → Settings → Products → Product Table. Enter your license key from the confirmation email, choose the default settings for your wholesale order forms, and click Save. You can now start displaying wholesale products in a compact table view. Use the plugin documentation to configure the table using the various options. Also check out our top 10 tips for improving your conversion rates, which include advice for WooCommerce wholesale stores. The easy way to create a wholesale order form for your store. Choose what to display in your wholesale order form, including product variation dropdowns. Columns. The table can contain various columns of product data. It supports all the main WooCommerce data fields (title, description, categories, product attributes, tags, stock, etc.). You can also add extra product data through custom fields and taxonomies. “Add-to-cart” buttons. By including add to cart buttons, wholesale customers order online directly from the product table view. You’re also able to choose whether to include a quantity selector and product variations in the table. You can create further options using the official Product Add-Ons plugin. This way, you can create a wholesale order form for easy bulk ordering and quick re-ordering. Wholesale enquiry forms. The product table knowledge base contains an article on how to replace the add to cart column with wholesale enquiry buttons. By adding buttons or links to the wholesale table, users can click through to a separate page with an enquiry form (created using a WP contact form plugin). Downloadable documents. Lots of Woo wholesale stores provide downloadable files with technical product information. This is useful for downloadable promotional materials, specification documents, etc. You can add a column with an icon, button or text for each product linking to a downloadable PDF or similar. Search, sort & filters. The product tables support various types of filters. This is important to help wholesale customers to find your products quickly and easily. There’s also a search box and the table can be sorted by any column. Add quick view buttons or links to the wholesale order form. By now, you know how to create a WooCommerce wholesale order form with various columns of information, and an add to cart column. 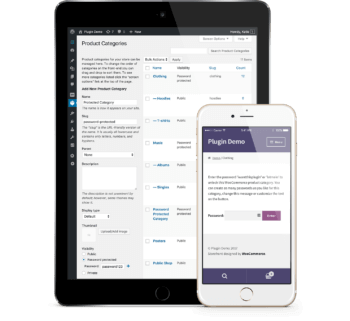 Customers can view product data, select variations and add to the cart from this one-page order form. But what if you want to show even more information or purchase orders, without taking wholesale users to a separate page for each product? You can do this by using WooCommerce Product Table with one of our other plugins, WooCommerce Quick View Pro. 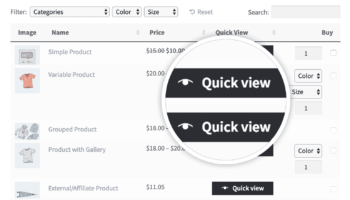 This wholesale quick view plugin lets you add quick view links or buttons to the order form. Trade customers can view extra product information, choose variations and add to the cart from a quick view lightbox. Once they have made their selections, they immediately return to the wholesale order form where they can add more products to their order. 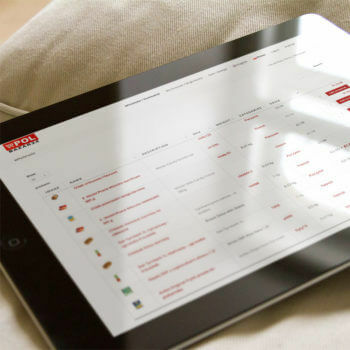 As a result, it’s much quicker than buying from a separate page – the perfect way to show extra product data while keeping customers on the order form page. Choose whether or not to include images in the quick view popup. Many wholesale stores sell non-visual products, so there’s no need to distract buyers with big images. Decide whether to include quick view buttons, or just let customers open the lightbox by clicking the product name or image. Change the wording of the Quick View button (e.g. to ‘Configure Options’, ‘Read More’ or ‘Customize Product’). Choose which information to display in the wholesale lightbox. 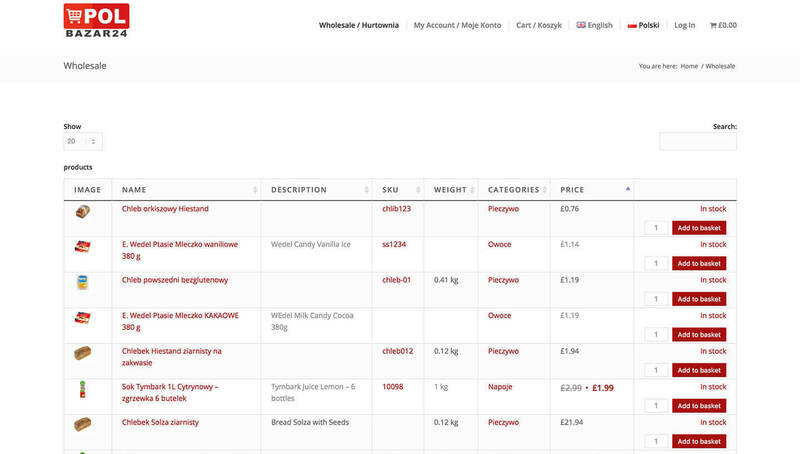 Add quick view options to your WooCommerce wholesale order form. Most people use WooCommerce Product Table by adding a shortcode to a normal page. If you’re using it with the methods for creating a protected wholesale area explained above, then you need to add the shortcode to your shop page template or category archives. 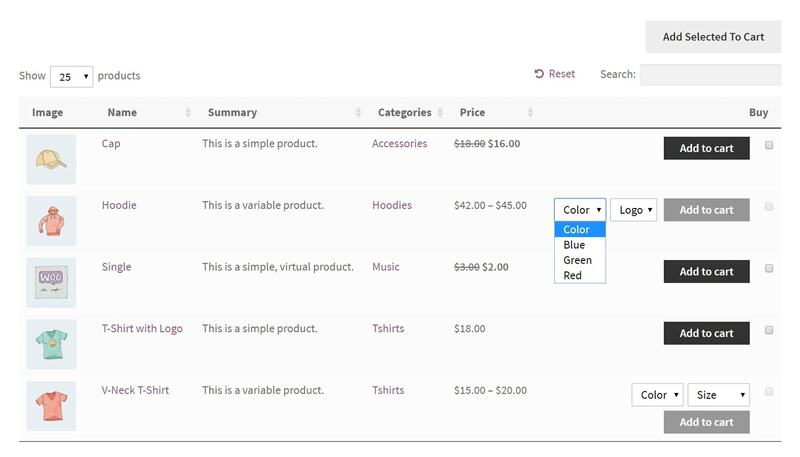 The plugin knowledge base includes instructions on how to automatically display product tables on the WooCommerce shop page or product categories. If you want to use the product table layout in the wholesale categories while using the default layout in the retail categories, then you need to do some extra coding. You’ll need to update the category archive template in your theme to show product table layouts in the protected reseller categories, while using the standard store layout for retail categories. If you don’t know how to do this, then I recommend posting a job on Codeable to find a WordPress expert. We have partnered with them to provide plugin customizations for our customers. It’s time to create your WooCommerce wholesale store! Use WooCommerce Protected Categories to lock down certain areas of your store to wholesalers only. Use Role Protected Categories so that only logged in wholesalers can see the B2B areas of your store. Create an entirely private wholesale store using the WooCommerce Private Store plugin. 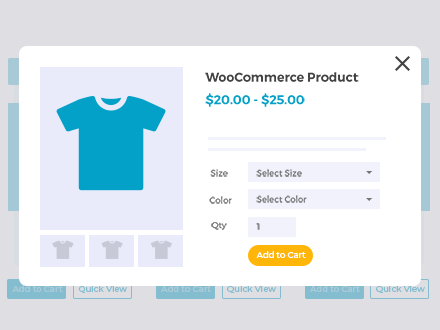 Use WooCommerce Product Table to list products in wholesale-friendly order forms. Add quick view lightboxes to your wholesale order forms. And even better, you can mix and match these methods to complete your own unique suite of WooCommerce wholesale plugins. 2 million websites now use WooCommerce, so there’s never been a better time to join this fantastic platform. Give wholesale customers a professional retail experience that can take your sales to the next level with your very own WooCommerce wholesale ordering section. Create a wholesale order form for your website today! Your plugin is clearly a valuable tool for a wholesale store. I don't think any of the 3 methods are ideal. Typically most stores would simply want to offer a second pricing on their existing products/store that are only shown.with an appropriate login. So a second price field show based on a user role is all that is necessary. It occurs to me after reading this that the level of duplication and management in the above techniques could get difficult to manage. Hi Jake, thanks for your comments. You're right, some wholesale stores wouldn't want to maintain duplicate products, whereas this is a benefit for others who want to use different codes etc. for their retail and wholesale products. Since launching the plugins, it has amazed me how many different ways people are using WooCommerce for wholesale purposes. Some want the role-based pricing method you mentioned, some want separate products with different descriptions and SKU's, others want a completely private wholesale-only store, and others want retail and wholesale areas on the same website. Hi Jake, you might be interested in an article I've just published about how to create a WooCommerce wholesale order form with role-based pricing. This does exactly what you described and avoids the need for duplication. Yes, the scenario Jake suggested is what I think should be ideal. By the way, thanks for creating the new article for that. I read it and that's what I wanted. But the above link is broken. You're right, I gave Jake the wrong link - sorry about that! It should be https://barn2.co.uk/woocommerce-user-role-based-pricing. Hi Max, a lot of our customers use our WooCommerce Product Table plugin with Wholesale Suite's 'Wholesale Pricing' plugin because it's more sophisticated than their wholesale order form/product table and has more features. The reason to use 'Wholesale Pricing' instead of WooCommerce Password Protected Categories would be if you want the price for each product to automatically change depending on the logged in user's role, whereas WooCommerce Password Protected Categories lets you have completely separate products for retail and wholesale - so it depends on your requirements. You can use WooCommerce Product Table for your wholesale order form whichever method you use for the wholesale pricing.